The Lord hath called for a famine; and it shall also come upon the land seven years. 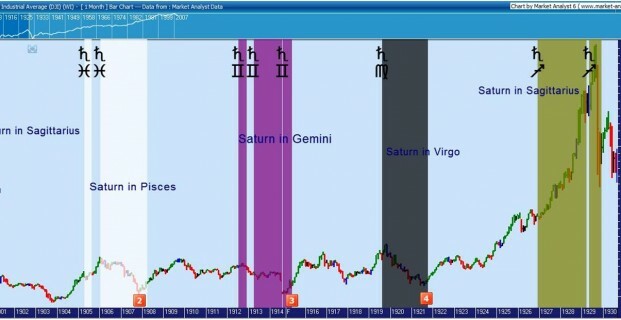 In the above quote from his Commodity Course, Gann refers directly to a planet – Saturn, known as the Time keeper, who every seven years completes a quarter of its 29.5 year cycle. (Gann rounded off to 30 years). What I have found in my study of Gann throughout the past five years is that he gives you so many clues to cycles in all his writings, you just have to take the time to dig and find. Take for example another quote from his Stock Market Course under the Dow Jones Resistance Levels. 1914 Dec 24 Low 53 1/8 This was the third time at this level. What do you notice about the years of separation? Yes, the fatal number 7. Let’s explore how the planet Saturn was involved in these particular years. The chart below shows the 4th Harmonic cycle of Saturn moving into a mutable sign at the end of which price has returned to almost the same price level. The Mutable zodiac signs are Gemini, Virgo, Sagittarius and Pisces. Saturn spends approximately 2.5 years in each zodiac sign, or 30 months shown by the vertical coloured zones. At the four cycle low points highlighted, the Dow made a low towards the later degrees of the mutable signs (20 -28 degrees) and started a general uptrend once it moved into the next quality, that is the cardinal signs. The next chart is an astrological quad-wheel with these four seven year lows shown overlapped on one chart. I have excluded all the other planets for clarity and easier delineation of Saturn’s position. You can see that the arrangement forms a cross/square, known as a mutable cross/square, as Saturn travelled approximately 90 degrees or a quarter of its cycle, called a 4th Harmonic, each seven years. If you look at the chart again, you can see a clear culmination of the 30 year cycle with the great Bull Market into Sept 1929 while Saturn was in the late degrees of Sagittarius. Astrologers know that the Moon and Saturn share the same vibration in terms of number. That is, the Synodic cycle of the Moon is 29.5 days (from New Moon to New Moon) and Saturn takes 29.5 years to complete a revolution of the Sun as Gann explains. Using a method astrologers call Secondary progressions, where a day equals a year, you can see how the Moon and Saturn share the same vibration. “He thought about the 9th verse where it says that everything should be burnt with fire seven years, meant either seven years of war or seven days. He had read where it says, “I will appoint a day for a year and a year for a day.” Therefore 7 days equals 7 years. From his annual forecasts in 1921, Gann had a table listing these days. The dates given will not always mark extreme high and low prices, but some kind of a rally or decline may be expected around these dates. These dates are actually the Moon Phases which I have plotted on the chart for 1921. The black dots are the New Moons and the circles are the Full Moons. You can see as Gann suggested changes in trend around these dates. Since our bodies are over seventy percent water, the Moon pulls our emotions and inner tides, just the same as it creates the tides in our oceans. Trading can be for most an emotional experience especially with an approaching Full Moon, when we feel overly emotional and irrational, often making impulsive and panicky decisions. Observing the Lunar phases is one of the easiest methods for traders to get in harmony with the natural rhythms of energy and understand market mass psychology. Whether you are forecasting long term or short term, the fatal number 7 will become obvious in your analysis. Consider the 7 days, 7 weeks or 7 years as Gann teaches and look back.